Home » How to Convert ASF to iMovie (iMovie 11 Included) on Mac? ASF, aka Advanced Systems Format (formerly Advanced Streaming Format, Active Streaming Format) is Microsoft's proprietary digital audio/digital video container format, especially meant for streaming media. ASF is part of the Media Foundation framework, therefore, playback under a Windows operating system is not very hard at all. But if you want to put ASF files on Mac for playback and editing with iMovie, it will not be easy. Why Can't you Import ASF to iMovie for Editing on Mac? A WMV file is in most circumstances encapsulated in the Advanced Systems Format (ASF) container format. The file extension .WMV typically describes ASF files that use Windows Media Video codecs. The audio codec used in conjunction with Windows Media Video is typically some version of Windows Media Audio, or in rarer cases, the deprecated Sipro ACELP.net audio codec. Microsoft recommends that ASF files containing non-Windows Media codecs use the generic .ASF file extension. The ASF container can optionally support digital rights management using a combination of elliptic curve cryptography key exchange, DES block cipher, a custom block cipher, RC4 stream cipher and the SHA-1 hashing function. So when your video is really some form of Windows Media Video, contained in a .ASF file, to use that video in iMovie, you need to convert it into a format that iMovie (iMovie 11 Included) accepts: MPEG-2, MPEG-4, DV, HDV, AVCHD, H.264. If you have QuickTime Pro, you can open your ASF files in it and then convert them to the format iMovie accepts. 1. 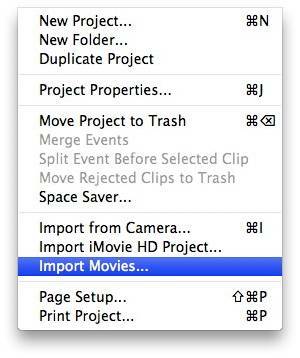 Launch QuickTime and open the movie file you wish to export to iMovie. 2. Open the "File" menu and select "Export." 3. Select "DV Stream" from the Export drop-down menu. 4. Click on "Save" to start the conversion process. QuickTime will notify you once it has finished converting the file. 5. Run iMovie, and then click "File -> Import Movies..." to upload the converted asf to iMovie. When it comes to compatibility issues while streaming and editing videos on Mac, Pavtube HD Video Converter for Mac comes to your rescue with its compact solution for any issue. This all-in-one toolbox can convert WMV, AVI, MP4, FLV, ASF, etc to iMovie supported video and audio format. It also can convert 4K, HD footages from camcorders (XAVC MXF, AVCHD) and TiVo/DVR recordings to MOV AIC video which is the most compatible video with iMovie. Before export iMovie supported video, you can do some simple editing work with the built-in video editor such as trim video footages, crop unwanted area, merge video to a single files, split video clips, etc. Learn iMovie Alternatives for Mac. ➤ Support the broadest types of devices with Mac Operation system. ➤ Fully compatible with 10.12 macOS Sierra, 10.11 El Capitan, etc. ➤ Adjust the output parameters for the video file and audio file. There are two ways about this: directly drag & drop the ASF files to the converter, or go to "File" menu then choose "Add Video/Audio" to locate the ASF files. Batch conversion is allowed by the excellent Mac converter, that's to say: you can convert several videos to iMovie on Mac conveniently. Apart from ASF, you also can import your DJI Mavic Pro 4k video, GoPro recordings, etc to convert to iMovie. 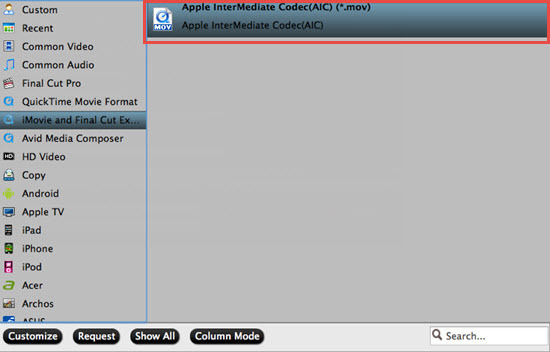 Click "Format" pull down list to select iMovie and Final Cut Express > Apple InterMediate Codec(AIC) (*.mov) as the output format. it will automatically set the resolution, bit rate and frame rate of the output file which match the demand of iMovie. By clicking "Edit selected task" button, you can trim, crop the video, or add watermark, adjust effect, attaching subtitles for pre-editing your video files so that you can simplify your iMovie editing. Click "Settings" to fix the frame rate, bitrate, video size, etc to your needs. To have a smooth editing with iMovie, you need create the files with the 1080p resolution and frame rate that matches your source footage. Click "Convert" button at the bottom right corner to finish endocing ASF to AIC .mov for iMovie on Mac OS X. After the conversion, click "Open" to locate the encoded videos and then launch iMovie to import the converted asf video into iMovie. 1. Launch iMovie and open the "File" menu. 2. Click on "Import" and select "Movies." 3. Locate the video file on your hard drive by using Finder. If a new window labeled HD Import Setting pops up on your screen, select either "Large" or "Full" and click on "OK."
4. Select the hard drive partition to which you wish to save your video file and click on the "Save" button. 5. Click on "Add to an existing event" and select the event from the drop-down menu. Alternately, you can create a new event by clicking on "Create new event" and entering a name. 6. Activate the check box next to "Optimize video" if you are importing a high-definition movie file. 7. Select either "Copy file" or "Move file" and click on "Import" to finish importing the QuickTime file. While the "Copy file" option will leave the exported file on your hard disk once the importing process is complete, the "Move file" option will instruct iMovie to delete the exported file after it has been successfully imported.